We worked with SEGA and Japan-based artist Daniel Isles - known under the moniker 'DirtyRobot' - to create a unique new print for Jet Set Radio! Daniel is a very talented artist and a huge SEGA fan and we sat down with him to ask some him questions about his work and his influences. 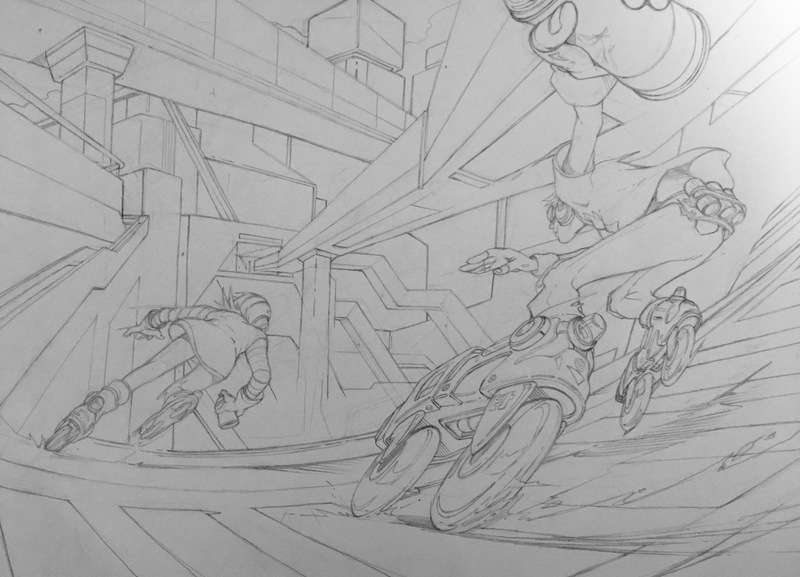 At the bottom of the article, you can see how Daniel evolved his Jet Set Radio illustration from a pencil sketch to a fully inked print. 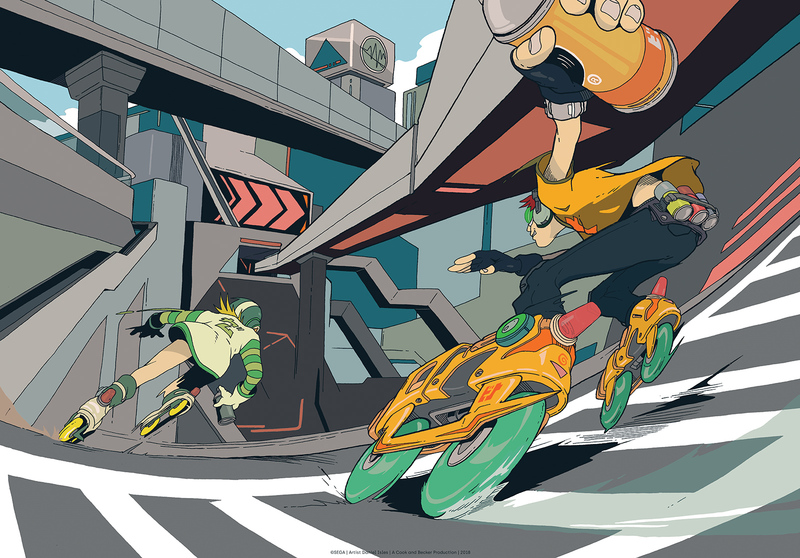 Jet Set Radio by 'DirtyRobot' depicts two Rudies from the game, Beat and Gum, “riding high through the streets of Tokyo-to on a smooth stream of supersonic sounds” from Jet Set Radio’s DJ Professor K. Spray can in hand, these characters with their Netrium skates are in the midst of their mission to claim their turf by tagging as many walls as possible. We asked Daniel about the way he works. Cook and Becker: First, can you tell us a little more about yourself? Daniel: My name is Daniel Isles and I sometimes go by the pen name 'DirtyRobot'. I’ve been drawing for quite some time now and I can honestly say it’s the one thing I truly love to do. C&B: Where did your artist name ‘DirtyRobot’ originate from? Daniel: The moment I decided to reprogram myself to become a better artist and human being. C&B: You’re a big SEGA fan. Can you tell us what you loved to play growing up? Daniel: This is very true! There are so many SEGA titles that I loved across multiple systems. Right now off the bat, the ones that spring to mind are; Revenge of Shinobi, Streets of Rage 2, Panzer Dragoon, Virtua Tennis, Out Run and Gunstar Heroes. C&B: Did you or do you ever derive inspiration for your illustrations from video games? Daniel: I do use elements in my work that are inspired by video games, especially the more retro type stuff. The 16-bit era being my main source. C&B: You draw your lines by hand with ink, but color digitally. What do you like specifically about this way of working? Daniel: I believe working this way allows the drawing to retain a kind of natural feel where the lines don’t appear to be super clinical or robotic. Having the ability to merge both traditional and digital techniques offers the best of both worlds in my opinion. C&B: In what way has living in Japan had an influence on the way you’ve developed your art style? Daniel: Japanese culture has pretty much always had an influence on my work in some way, whether its been through games, manga or animation. I’d say since moving here the environment has helped to shape my work in subtle ways, which I think has allowed me to find a delicate balance between both eastern and western cultures. C&B:You’ve brought to life characters that tend to reappear in your illustrations. They each have their own little bio’s on your website, where you describe certain traits or what they do. Since you’ve also been into creating comics since you were nine, do the characters you illustrate each have their own developed stories that only you know about? Daniel: Some of them do for sure. Right now, I’ve taken a bunch of characters and began fleshing out their life stories even further, to begin work on my upcoming comic series. Also, I think it’s nice to give some sort of insight to these unknown characters, so people can get a somewhat deeper understanding of who they are and what it is they do, while still keeping an air of mystique about them.